Is Cult Classic Allegory for McCarthyism and Communism? 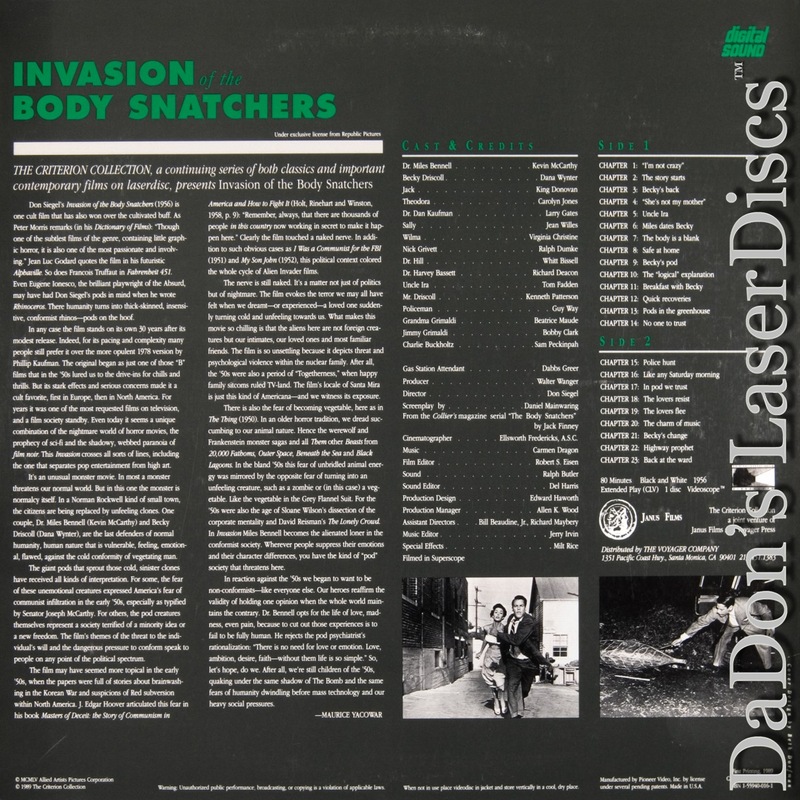 Invasion of The Body Snatchers 1956 - 80 min. - Black and White Genre: Sci-Fi Not Rated Country: USA LaserDisc Movie Storyline: Don Siegel's cult masterpiece, interpreted as an allegory of both McCarthyism and Communism, is undoubtedly one of the screen's most disturbing evocations of paranoia. It stars Kevin McCarthy as Dr. Miles Binnell, a physician whose traumatized arrival in the emergency room of a San Francisco hospital leads the staff to believe he's lost his mind. In a series of flashbacks, he unwinds a bizarre account of his last few days. After his return from a trip to rural Santa Mira, his nurse, Sally (Jean Willes), explains that his office has been flooded with patients who have made appointments yet never appeared. Former girlfriend Becky Driscoll (Dana Wynter) tells him that she's unable to rid herself of the belief that the man claiming to be her uncle is an impostor. A hysterical young boy refuses to return home, claiming that his mother is not his mother. Miles's concern over this pattern of incidents, temporarily allayed by some jargon from the town psychiatrist, is newly aroused when he gets a phone call from friend Jack Belicec (King Donovan), who begs him to come over and take a look at the strange mannequinlike figure that's suddenly appeared on his pool table. This exceptionally well written and directed fable, the ultimate comment on the subtly coercive conformity of the 1950s, may be Siegel's best film, and it is undoubtedly one of the most exciting science fiction films ever made.